Apple Barrel Craft Paint is a versatile, high quality acrylic paint for crafts. Excellent coverage. Fast-drying. Use on all porous surfaces. All colors are AP certified non-toxic and water-based. These paints are great, not only for beginners but adults too! They are just as cheap as dollar tree but 5 times the quality! I use them for all my craft projects and even some art ones too! Five Stars FOR SURE! Excellent value for a very good quality, starter set of acrylic paints! They are not just for the beginner, but a nice selection to replenish your supplies. This product met my expectations. I like that it easily comes off the skin with soap and water. Yes! It was perfect for a beginner like me. I bought it a while ago and i still have most of the paints. Will these paints stick to leather? 1. We do not recommend Apple Barrel paints for Leather. are these paints matt finish, gloss, semi gloss or what? thank you. 1. 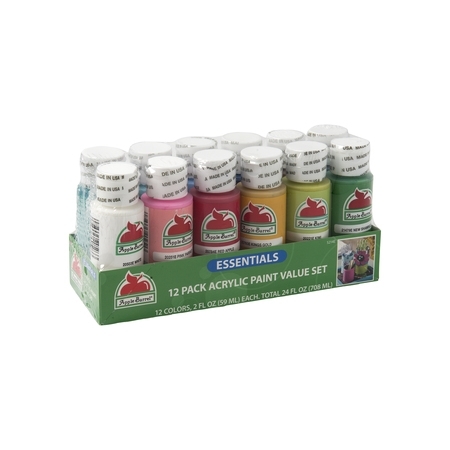 Apple Barrel Essentials are 12 Apple Barrel Acrylic craft paints. They dry to a Matte Finish. Can this be used on glass that will be outside? 1. Unfortunately, we do not recommend this application. Apple Barrel Acrylic paints are not suitable for direct to glass painting applications. Apple Barrel Acrylic paints are water based acrylic craft paints, formulated for indoor paint applications to porous surfaces only.